Heading into Saturday afternoon, the Hurricanes were a perfect 7-0 under coach Al Golden in games that followed a loss. That streak came to an end at Sun Life Stadium, and it came at a price. Junior quarterback Stephen Morris was carried off the field in the fourth quarter with an ankle injury, and Ryan Williams’ comeback attempt fell short. Miami fell to the North Carolina Tar Heels,18-14. The loss is the first conference defeat for Miami (4-3, 3-1), which is now in a four-way tie for first place in the ACC Coastal Division. 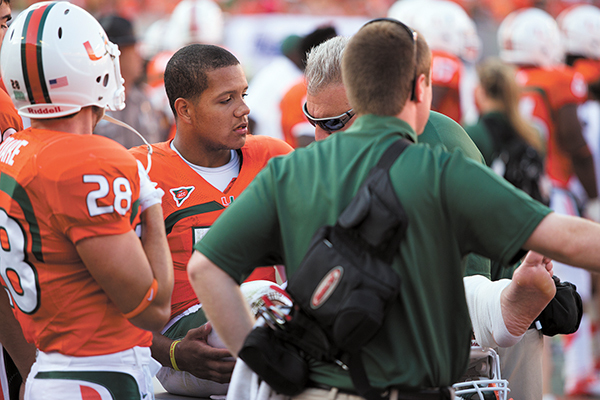 Morris scrambled near the Hurricanes’ sideline, fell awkwardly on his left ankle and needed assistance to get up. He was attended to on the sidelines, where he was given a walking boot, and made his way to the locker room. After filling in on the previous drive following the injury, Williams came in for his first full drive with 1:47 remaining in the game and the Canes down four points. He was able to drive the team 59 yards down the field, but on fourth down and 16 yards to go, an 11-yard reception to Clive Walford ending Miami’s day. X-rays on Morris’ ankle came back negative, and Golden revealed in his weekly post-game teleconference that he has a sprain, but not a high ankle sprain. It is still unclear how much time Morris is projected to miss, but there is a slim chance he starts this weekend. Miami will prepare during the week as if Williams will be the starter, but Morris may have a shot to start depending on how he feels during the week. The Seminoles, now ranked No. 12 in the AP poll, will be the third opponent currently ranked in the top 10 the Canes will have faced. Senior running back Mike James believes the looming challenge makes it easier to move past the loss. “You have to come around fast, no matter who it is, but knowing that it’s Florida State, with the added animosity, it just makes it that much easier to move on,” he said. For Williams, who may well be starting against a top-10 team for the first time in his career, it will be a game to look forward to.